"Enlightened" This scene really caught my eye while shooting along the Gorge on the Washington side near Panther Creek. 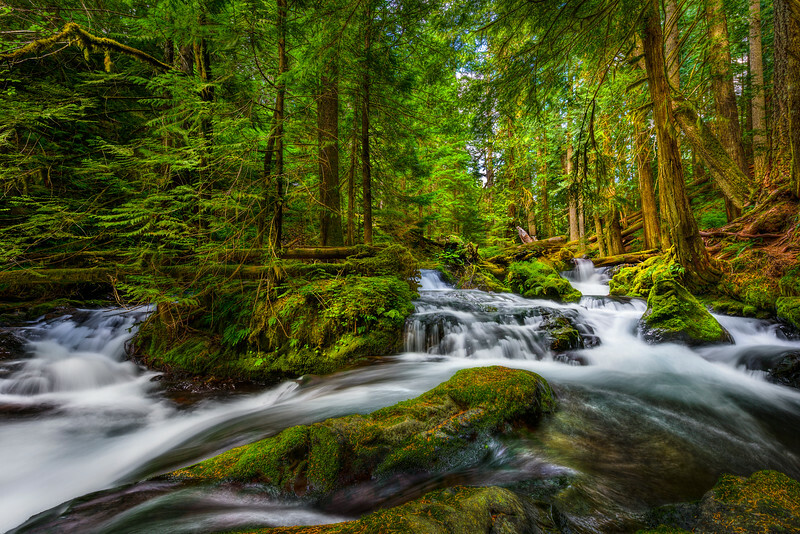 The flowing water cascading down with green moss around and the light glowing in the trees behind. This image is still a work in progress -- let me know if you enjoy it. I really liked the way the water curved around on both sides and the soft texture of the water was captured. You can just hear the rushing of the water coming by! Just an amazing amount of detail is in the image as you can see the pine needles on the moss covered rock in the front. A little about the capture - This is captured with the new Nikon D810 (now the most amazing camera for landscape photographers!) Nikon D810 and Nikon 14-24mm f/2.8 at 14mm. 3 images. ISO 125. f/13, 1.3 seconds for the primary exposure, .6 seconds for the optimum texture for the water. 1/3 second to keep from blowing out the sky and tree in the back. Blended using Mark Metternich's Blend-If techniques. Enjoy and LIKE and share if you like it! Copyright John Harrison Photography — in Washington.